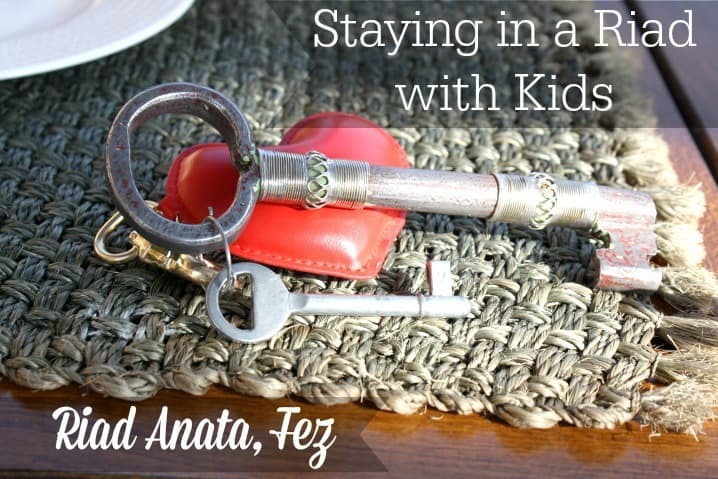 This is the last post in my series on our visit to Fez, Morocco with our kids. We spent 4 days in northern Morocco last month, driving from Marrakech. When we were visiting, a spent several hours one afternoon sitting on the roof of Riad Anata, writing and capturing my thoughts on our visit. I had been to Fez 10 years earlier, before MarocBaba, before kids – it was the first Moroccan city I had seen. Experiencing it now was decidedly different. It was as if I had never been there before. Maybe it’s because memories fade, or maybe I’ve simply acclimated to Moroccan life but the memories I had held onto, just weren’t revived. Sunday was our last day and we had arranged a morning walking tour with Fattah from Journey Beyond Travel (disclaimer I work for JBT as their social media coordinator and blog editor). We wanted to get an early start as we still needed to drive back to Marrakech that afternoon. He picked us up at the riad at 9am and we set out. 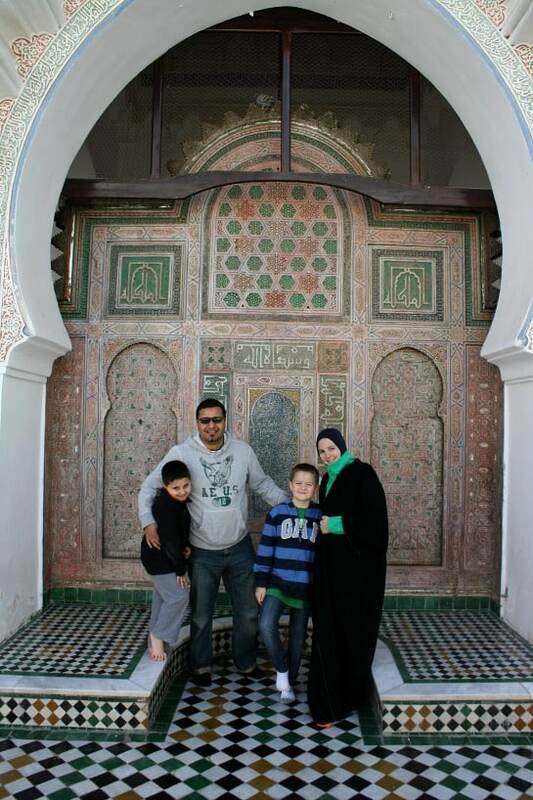 Here’s something I want to reiterate about visiting Morocco with kids – Moroccans love kids. They really do. They’ve got patience for miles. I’ve never been somewhere as friendly and flexible to the needs of children as in Morocco. Fattah was no different and our boys immediately took to him. 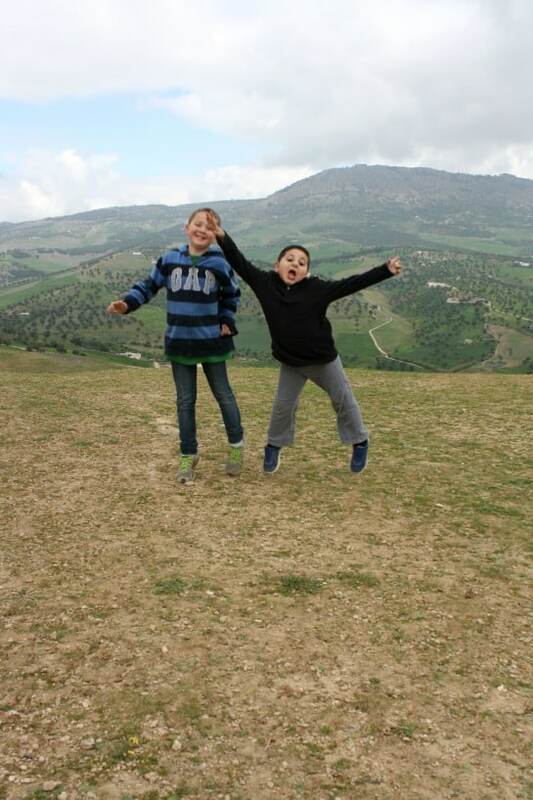 We had access to a car so our first stop was to visit one of the hills overlooking Fez. 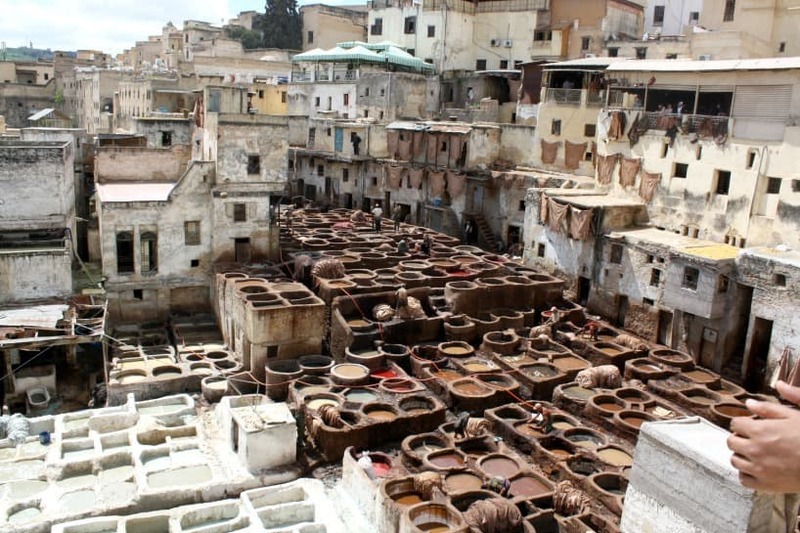 As you can see from the first picture, the old medina of Fez is a sprawling pedestrian city. It’s the largest in the world. The city is hemmed in by two mountain ranges, the Rif Mountains and the Middle Atlas Mountains which keep the city temperate year-round. On the hills around the city you’ll find tanners lying out wet animal skins to dry. You’ll also find many graveyards, as to bury people outside the city walls meant going to the hills – of which there are many. But, I’ll come back to that. The Merinid Tombs are perched on one of the highest hills overlooking Fez and we began our tour here. 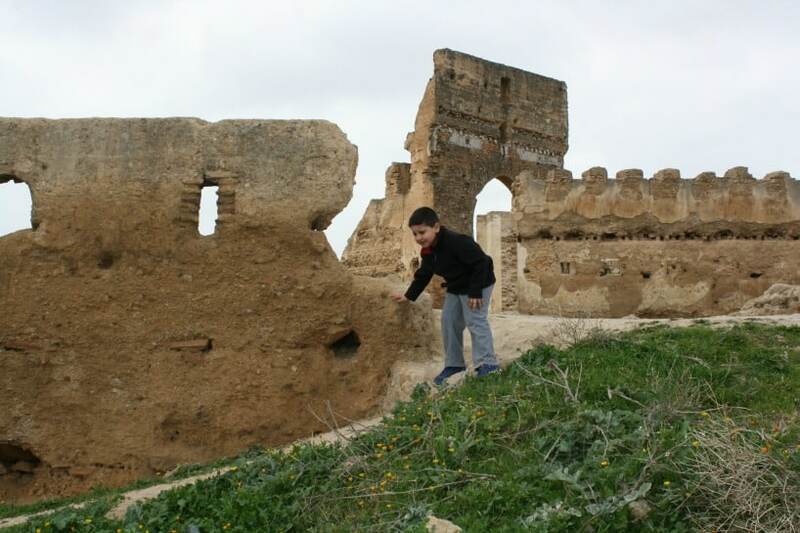 The Merinid’s ruled Morocco from the 13th-15th centuries and these are the ruins of a palace. Truthfully there’s not a lot to see in the actual ruins but the kids had a blast climbing around them. The views over Fez were wonderful! If you’re not on a guided tour and want to see, I suggest a taxi as it’s a long climb up. You can request for the taxi to stay and take you back down. There’s no way I would have hiked it with my kids. One of the most photographed images of Fez is the iconic blue gate or Bab Boujeloud. It’s blue on one side and green on the other as you can see from the pictures. But the famous colored gate was built during the French protectorate. The original “gate” is just to the left if you’re facing the ornate entrance. Our riad wasn’t far from this area and right inside this space you’ll find lots of outdoor restaurants. Don’t make a special trip just to see the blue gate – it’s a gate. We parked our car and then set off on foot to explore pedestrian Fez. One stop was at a ferran to check out bread baking in progress. 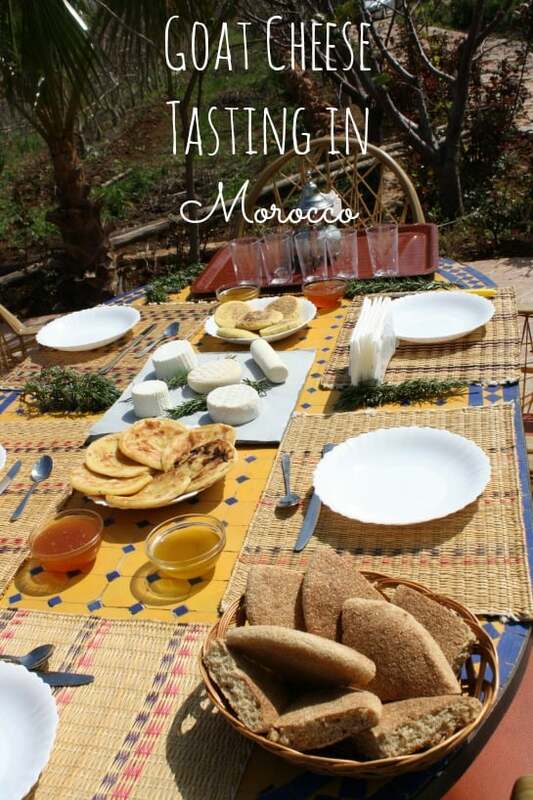 We don’t send our bread to the ferran in Marrakech (but we have them – if you take our food tour we’ll take you to one!) so it was fun for the kids to check out where the bakery bread comes from and how it is made. We learned about traditional architecture like; why are there two doors at two heights with two knockers on traditional homes? The higher, taller doors are for someone arriving on horseback or camelback and the knocker makes one sound. The lower door is for someone on foot and makes it’s own sound. This way the people inside would know what to expect. You’ll see a lot of scaffolding in places supporting buildings. There’s an effort being made to restore homes before they crumble but this can only be done so quickly. 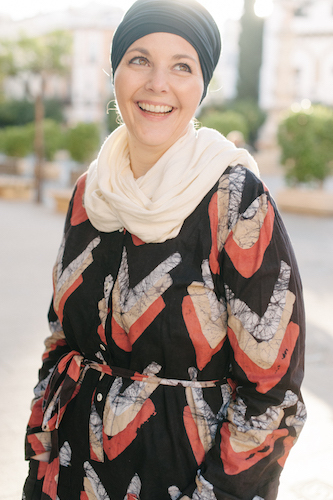 One of the differences we have when visiting places in Morocco is that we can enter mosques and other religious sites that are typically off-limits to non-Muslims. For a long time this bothered me. I thought, as Muslims we should welcome people in and let them experience and witness our faith. My opinion changed in Fez. 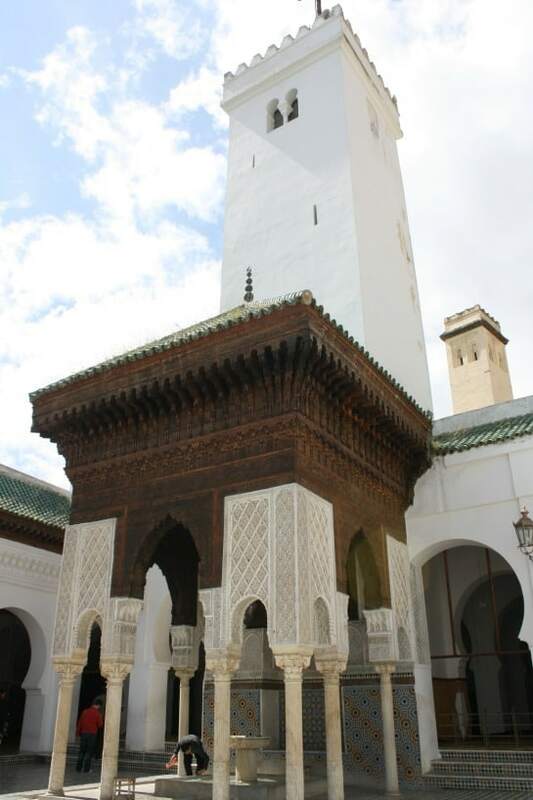 The image above is of the al-Karaouine mosque, the oldest university in the world – and was founded by a woman. It still operates today as a mosque and place for Islamic learning. Inside it was impressive and didn’t look like it was more than a thousand years old. There was a very nice prayer space and washroom for women that was separate but didn’t feel at all like an after thought. It felt very well planned and thought out. While MarocBaba and the boys visited the men’s prayer space I was left on my own to explore the women’s areas. The caretaker was gracious, asked me if I wanted to pray and showed me where to go. This picture doesn’t do it justice but look at the closest water pool. The water was crystal clear. The water resevoirs were clean and to think this has been functioning as a wash space since 859! I’ve been to washrooms and women’s prayer areas in American mosques in much worse condition. This gets me back to my point. There were loads of tourists in Fez while we were there, and they want to see everything – I get it – it’s awesome! But sadly, many can be rude and pushy. In fact one women literally huffed in my face when I tried to squeeze by her to go through the entrance to the mosque. This was a very wonderful and spiritual place. Praying here made me very happy and at peace. I tried to imagine what it would be like with hundreds of tourists milling around inside snapping pictures and, well, I think you see my point? 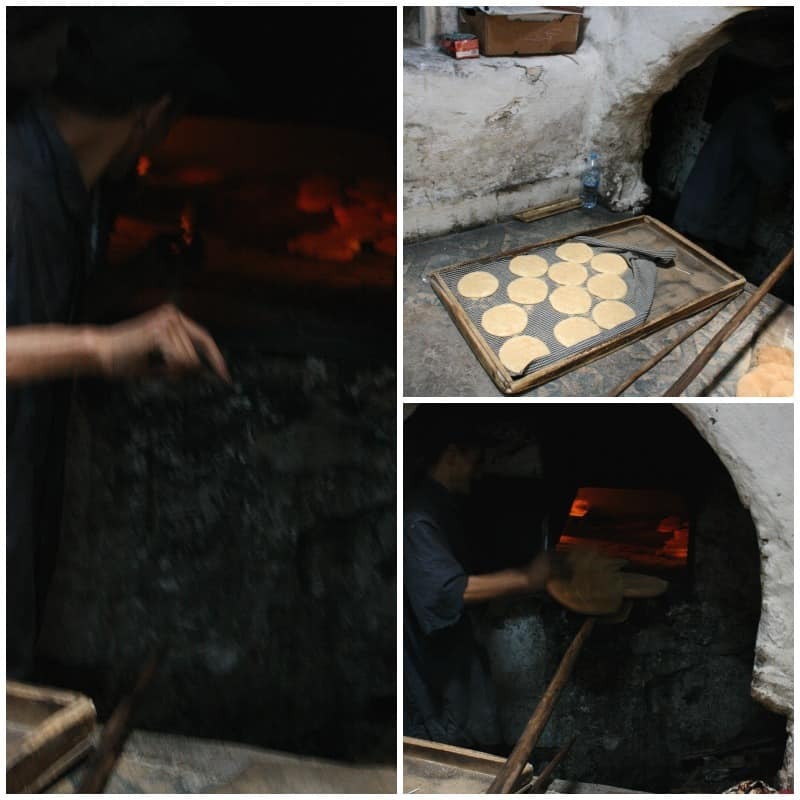 If you can’t visit the inside of al Karaouine you can visit the Bou Inania Medrassa nearby. This is an old Koranic school with some amazing zellige (tile work), carvings, and even stained glass windows which aren’t common in Islamic buildings. Not the most interesting place for kids, at least mine but they had a blast finding fun backgrounds to take pictures on. 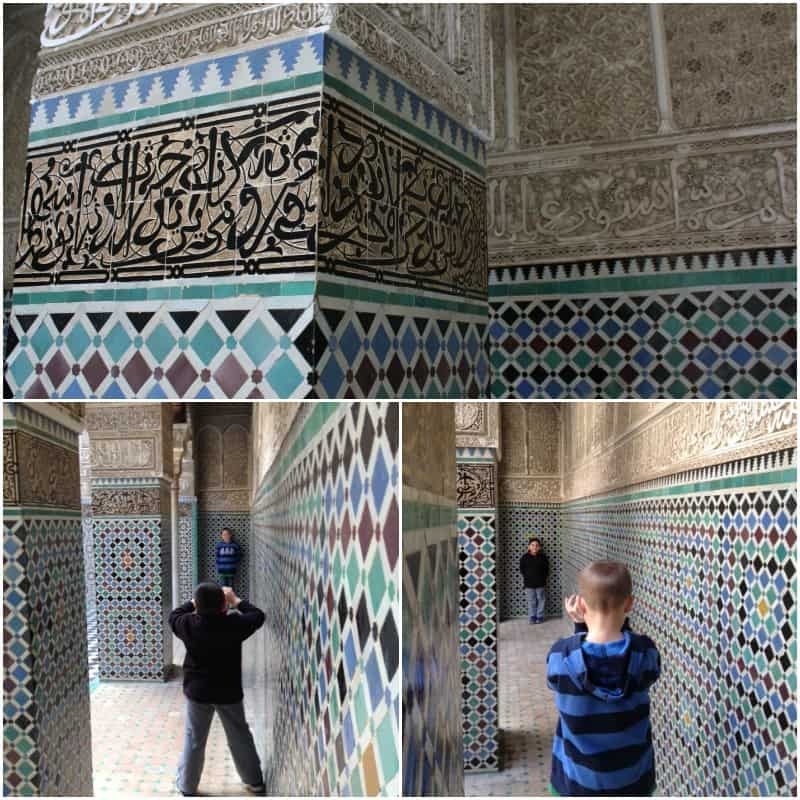 Another fun activity we did with them was to have them see how many times the could find “Allah” in the carvings. Fattah deliberately wove us through the historical sites and markets, showing us the different souks. Like in Marrakech, Fez is divided into different work areas. There’s a metal working souk, a dying souk, a woodworking souk etc. It was fun to see how different things were compared to Marrakech. I found myself overwhelmed a few times which was something I didn’t expect. Most people find Marrakechs’ souks more confusing but I was absolutely lost in Fez. 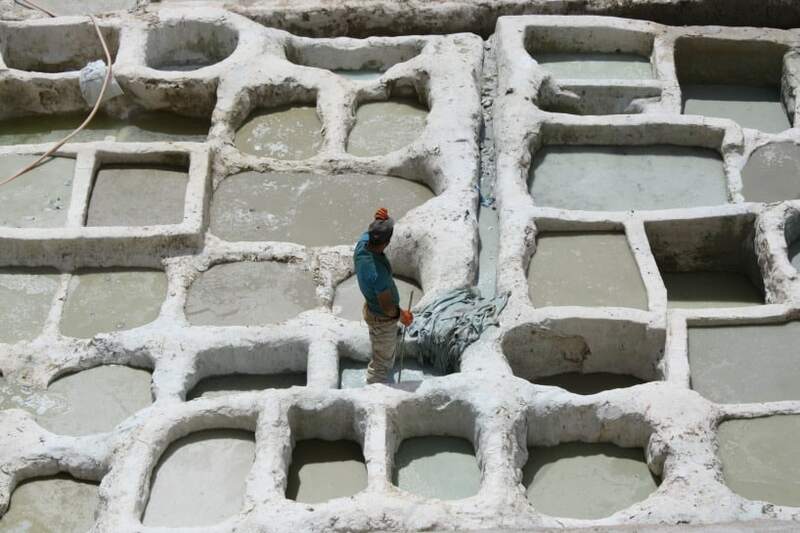 We were all starting to get tired (and hungry) when we arrived at the most infamous spot in Fez – the tanneries. These date back to the 11th century and today leather from sheep, goat, camel and cow skin is dyed in a way that hasn’t changed much in centuries. There’s two types of vats, the first is the “primer” that’s a mix of pigeon droppings and cow urine. It breaks down the skin and removes any hair that might be left. The next step in the process is to clean the skins and prepare them to be colored. The color vats are filled with natural vegetable dyes. The skin is soaked until the right color is achieved and is then hung up to dry. The colored leather is then sold to leathersmiths all over the city to make everything from purses to shoes and belts. A word to the wise, this can be a very smelly place. Most often you’ll be presented with a mint sprig on entering to sniff – the “Moroccan gas mask.” If you or your kids have a queasy stomach it might be a quick trip to view and leave. If you’re with a knowledgeable guide you’ll be able to learn a lot about the process and history while watching it in action. You’ll also most likely find many leather goods for sale. My advice, don’t buy it from there. Any leather you buy in the city has probably come from the tannery. You’ll get a better price if you look elsewhere. Fez is full of hills and the medina is car free so you’ll be walking a lot. If you have a small child consider a stroller to help. Keep this in mind when considering how much ground you want to cover. The old medina is a winding maze. Even with MarocBaba at the helm we were sometimes at a loss when it came to directions. Having a native, reputable guide is essential. It’s not someplace I’d recommend “getting lost” especially with children. We were surprised to discover the cost of food in Fez was about 1/2 has much as it is in Marrakech. If you want to treat yourself to a nicer meal, do it here. Mix up your activities. There’s a lot going on in Fez, so venture off the guide book. 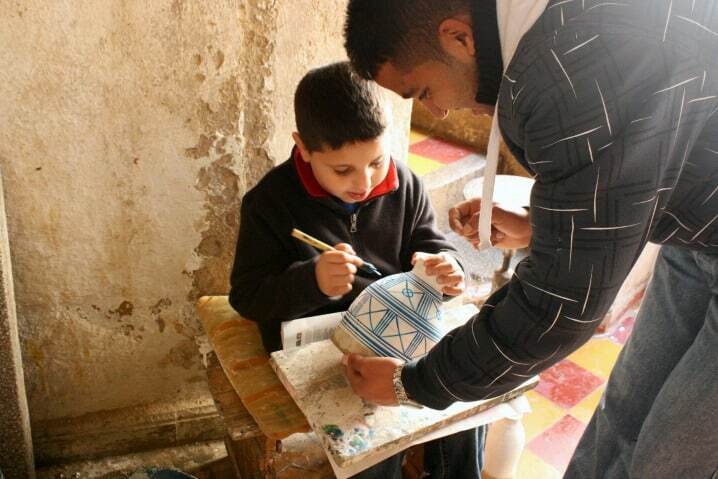 The View From Fez is a great blog to follow for activities that are happening in the city. 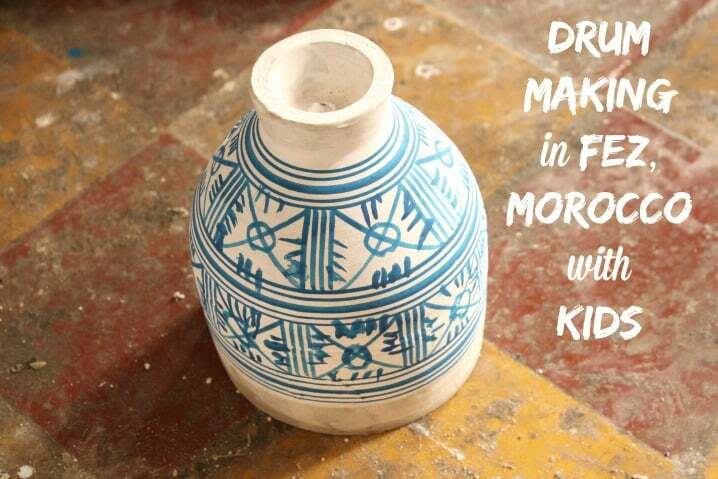 I loved the pottery here, especially the distinctive blue designs. Get some! We arranged our Fez tour with Journey Beyond Travel. While I work for the company, I also have found them to be one of the best tour companies in Morocco. I wouldn’t work with a company I didn’t believe in! If you’re looking to visit and want a personalized experience, consider them! I read your tips about visiting Fez. I don’t agree with one of them. It is no problem getting lost in the medina. Every way up leads to a gate outside and at every gate you can get a petit taxi. There are also signs to the ends of the tourists routes nowadays. There is a book in Arabic, French and English, called Fez from bab to bab. I love this book. 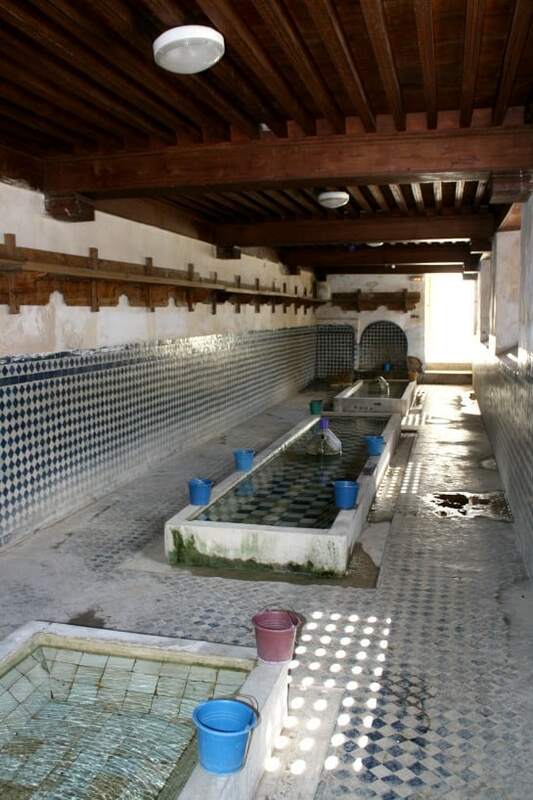 It contains 10 itineraries through the medina with very detailed information. The autor is a local Fessi. And it contains a very detailed map of the medina with every street and backalley on it. If you can read the Arabic streetsigns of the less touristic streets, you will have never to be lost again in old Fez. I appreciate your comment. Having spoken with dozens of visitors getting lost is a big concern and worry. I think it is important to note. Thanks for the book suggestion, I’m sure plenty of people will find it useful. i really enjoyed this article, as an American now living in Fes, I have a particular affinity for Fes. 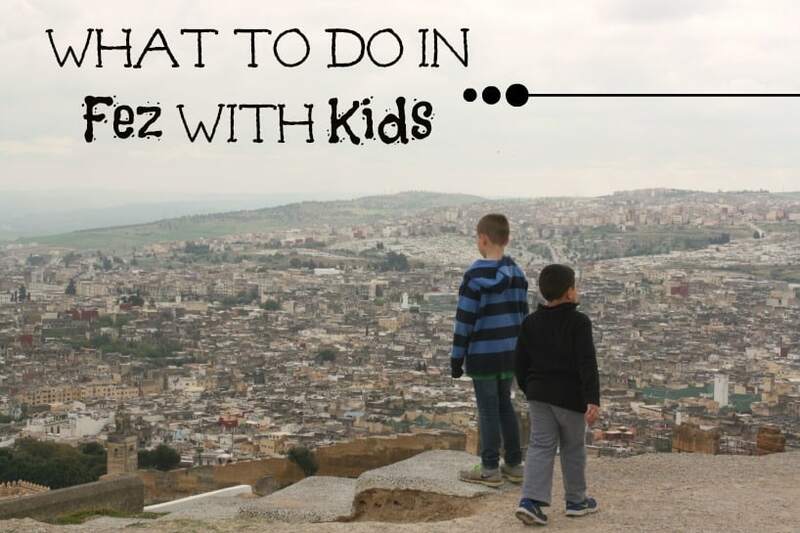 There are so many wonderful things to do in Fes and it can really be a haven for children if you know where to go. Did you happen to visit the Sbil gardens? One of the things that amazed me was when school let out. Very young children walked home through the maze by themselves. This would NEVER happen in the US. I asked a resident about it, and he said that everyone knows all the children and look out for them. Even the smallest are in no danger. The donkeys, which carry the rubble out of the medina also know their way out of the medina by themselves! I loved reading this, as you guys did so much we did–and of course Fez is where I was not sick so my most pleasant memories are from there and Tangiers. I remember the university/mosque–I was so impressed that it had been founded by a woman. Actually I remember everything you mention! So much fun!